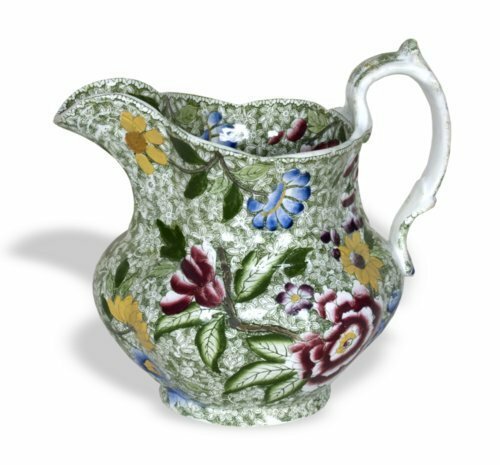 White ceramic ironstone pitcher with a green transfer-printed design overall featuring hand-tinted red, blue, and yellow flowers. The design is very similar to Spode pattern B173. The pitcher was owned by the Page family from North Topeka. Thomas Page immigrated from Dunshalt, Scotland, in 1866 and moved to Topeka in 1871. He owned the Mid-Continent Mill steel roller mill. The pitcher was donated by his daughter, Euphemia B. Page.